Nationwide, about 19 percent of Hispanics ages 25-34 had earned an associate degree or higher as of 2009, compared to 49 percent of white students and 29 percent of black students, according to the College Board. At this morning’s gathering of education leaders, the College Board released a report offering 10 recommendations for how the country can help more Hispanics graduate. The ten recommendations aren’t exactly revolutionary, however. 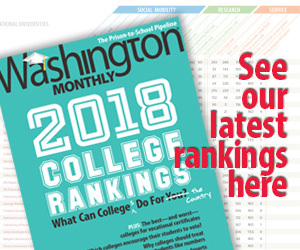 College Board recommends vaguely “that states and localities move toward professional norms for staffing middle and high school counseling offices” and “that federal and state officials encourage increased access by providing more need-based grant aid, making the process of applying for financial assistance more transparent and predictable.” All of this vague “just do what we’re doing now better” suggestions are basically a recipe for no change. Well good luck with that. It’s probably worth pointing out here that we know that the number one reason for low college completion is financial problems. A good way to ensure more college completion would be to make college cheaper. That’s how American got large portions of, say, Italian-Americans immigrants through college, through use of the well-supported state universities and the G.I . Bill in the aftermath of World War II. The College Board says it recommends “restraining growth in college costs and prices, using available aid and resources wisely, and insisting that state governments meet their obligations for funding higher education.” That’s vague and it’s not going to be good enough.